I will be doing a Tell All post coming up! 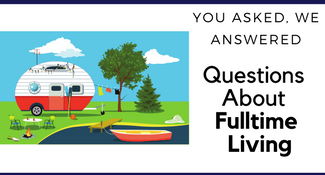 I want to answer any and all questions you have about traveling full time, living in an RV, road schooling or anything about our life style NOTHING is off limits! Give me your questions now and I will answer them in an upcoming post!! So I posted and you asked! Ready for the questions? Here goes! Right now our ‘home’ according to the paperwork, is in FL with my parents. We use their street address as our home base and we are in FL for 3-4 months of the year for the holidays and to help my dad out during his busy season. As far as room in an RV it’s all about how you make space. You have to shop and find what features you like and what you don’t. We have a bunkhouse that is a room at the back of the RV of bunk beds for the kids, it’s also where they play with their toys, where they spread out with Legos and Puzzels. The key thing is we have 3 slide outs that expand the RV when we park one of them being a super slide (bigger than the average slide). The rest comes with organizing, RVs were meant to hide stuff under seats and where you least expect it! We defiantly have more family time. We do just about everything together. Hubby and I have times we go out alone to do things that are easier with our 4 kids in tow, like one of us will go out and do laundry, grocery shopping and heading to Starbucks for Internet is always better without kids in tow. But school time we spend together we explore our new area together and travel together. Our mail gets sent to my parents house they have been nice enough to handle our mail (though there are perks, my mom get’s first dibs at all the review products sent!) For those who aren’t so lucky there are mail services that give you an address in any state you want and then when your say they will send mail to you. You can have it sent to the RV park you are at if they allow it or via General Delivery to any Post Office. We claim residency in FL because that is where we have our mail sent. It is also an easy state for homeschool laws. The car and RV are registered there and we have Fl driver license and the kids are registered for school there. You can pick any state via the mail services but if you consider one with no state taxes (like Florida) and easy homeschool laws. Texas is most full timers first choice because they are very lax on homeschool laws. I will address the financial aspect below because I have another question on it as well. For the room RV living forces you to get outside more. Campgrounds are made for socializing. Kids can get out and run, bad weather days you spend out doing something. We tend to take to the Mall and walk that day or to an indoor attraction we have been wanting to do. We cut down how many toys the kids have they have a bin of legos and then a milk crate of toys. Since Christmas, it’s expanded to two crates but it will drain down as they figure out what they really want to play with what they don’t get donated. I find that the less toys they have the more they use their imaginations building forts and inventing games. They clean up before the younger ones nap time and again before bed. We contain their toys to their room. Clothes we have almost 2 weeks worth of clothes. We do laundry once a week and being it’s at a laundromat (usually right at the RV park) it’s done all at once and washed dried and put away within a 3 hours span one morning a week. As for when they outgrow clothes we hit the local thrift stores. 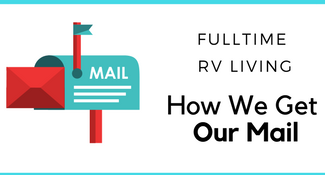 I did a post on How I Get My Kids Clothes For Free and the concept still applies in the RV. To answer this and Katie’s question I could just say yes it’s cheaper but let me show you the breakdown. As you see with these numbers we save about $700 a month. Now let me point out a few things. 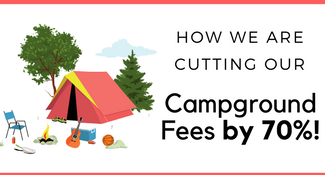 ‘Rent’ or campground fees vary greatly. 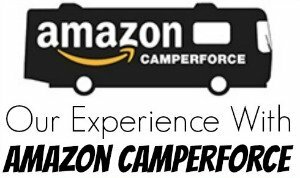 With the Amazon program we were with we had no campground fees Sept – Dec. Other programs we will be working with in the future are the same way (like disaster cleanup) Sometimes like Jan – March our RV park is more expensive in FL but Hubby is working so our income increases more than normal as well. We had 2 cars in our stick and bricks (S&B) we now have 1 so it dropped insurance and car payments. We have a $100 budget for RV repair but we have a warranty on our RV and the most expensive thing we have had to buy was a propane gauge for $30 so that budget goes mostly untouched. Health insurance dropped because we stopped using hubby’s work insurance and went with Medi-Share. 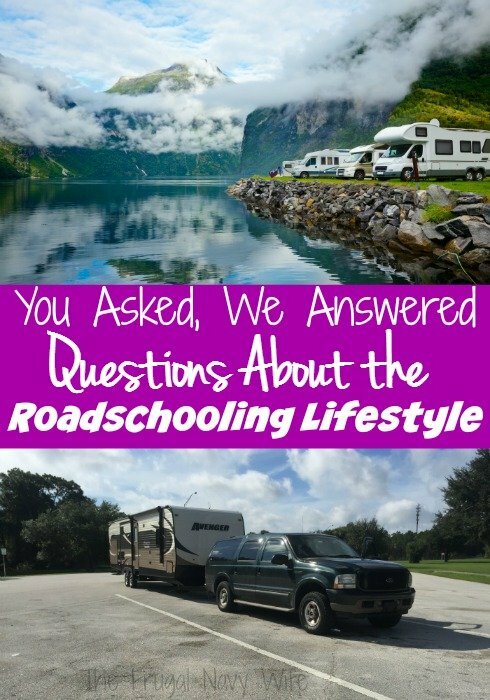 Honestly it depends on the type of RV you buy. If you are wanting to visit Alaska you really want an All Weather RV that is better insulated (heck any full timer should look into this type as well) Our RV is heated with propane and there have been a few nights hubby had to go out in the 20 degree weather and switch the propane tank over because the one was empty. Then to save on propane we use a small space heater during the day. We don’t pay electric at the campgrounds unless we are there a month or more so we try to use the electric one as much as possible since we DO have to pay for propane. In general we haven’t avoided colder weather but we have been south this winter then plan to head up the east coast as it warms up. We don’t have any plans to be in Alaska or Maine in the dead of winter though! 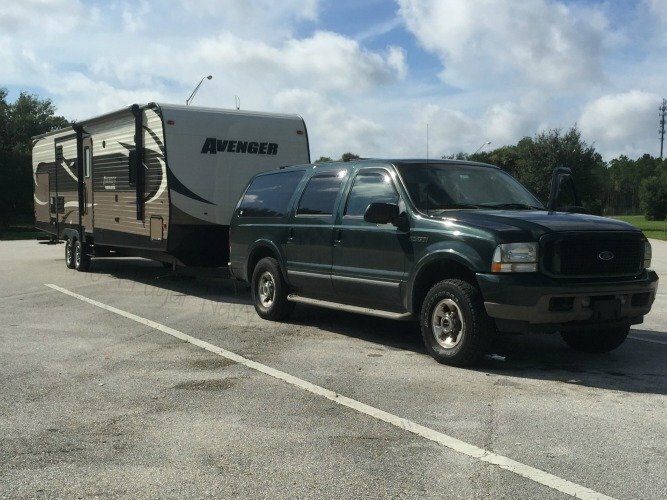 We have a Travel Trailer so we unhook our Excursion when the RV is parked and use it. The same goes to those who have 5th Wheels. 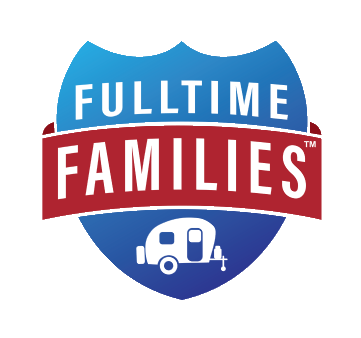 The families that have the motor homes (Class A, Class B or Class C) that you are thinking more of will tow a car behind the RV so the RV stays hooked up and they still have transportation. Well, we are a family of 6 with 4 kids. Our kids are ages 7, 5, 3, and 1. I want to point out before I answer that as a family of 6 on the road from talking to other families who do this full time we are actually a ‘smaller’ family then average. I’m not kidding! Our Traveling Tribe is a family of 14! But here is the details. Some days I want to run away and go hide from my family, kids have their moments. But you know what? I felt that way in a sticks and bricks house too. Kids will be kids and some days they just aren’t at their best. But I find myself appreciating them a bit more. I am around to see their faces light up when they catch on to something, I am their teacher and get to tell them about things that excite me and watch them get excited. I will admit some days the ‘clutter’ of things not getting out away gets to me (like right now as I look around the RV) but to clean the RV and put things away? I have this RV show ready in 30 minutes tops where as in my sticks and bricks it would take a day sometimes two! Life is a lot simpler and as we slowly adjust we are adjusting to each other and the crazy days are fewer and farer in between. Living in an RV does bring it’s own struggles. Dirty laundry seems to take over a day before laundry day. Melas have to be simpler because there just isn’t the room to cook them. Plus there isn’t room for all the things that cause a mess in a S&B house. 1 bin of toys take 5 minutes or less to clean up and the mess is contained in the kids room. Little things are easier and the things that are a challenge (like cooking without setting off the smoke detector or always burning the bottom of the rolls) because the new norm. Every life style has it’s stresses and rewards. 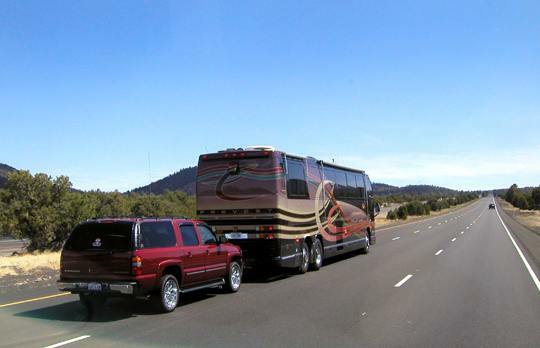 If you are unsure if this si for you, on your next vacation rent an RV for 2+ weeks and go out and give it a try. It’s the best way to see if you will sink or swim! We did very few Christmas decorations compared to what we were used to in a Stick and Bricks. To be honest we didn’t do a Christmas Tree. This was one holiday I wasn’t ready to give up. We visited family for the holiday and had Christmas and the grandparents house, used their tree and Santa delivered gifts there. I did stalk my favorite RV blogs on how they did Christmas and one of my favorites things I saw was making a tree out of lights on a wall or door. saves time plus you get some lights up. In most cases they seemed to do what you did and got a small tree for the table and did gifts underneath. Still have questions? Nothing is off limits leave your question as a comment and I will answer! Not Really. 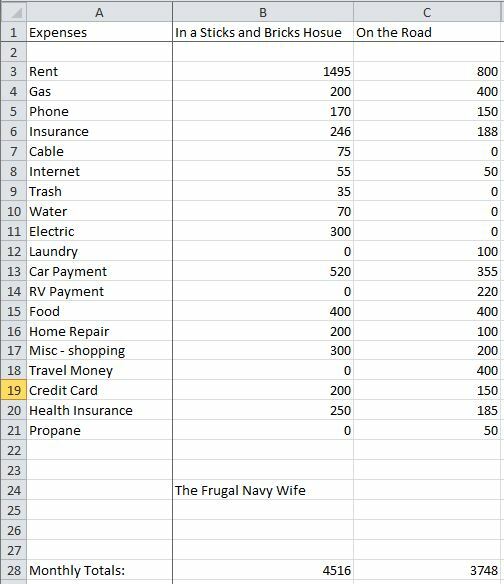 We are far from rich, we are actually paying off debt while on the road. The key is to have a mobile job, something you can do anywhere, for me that’s writing. I have met others that do this by consulting, travel nurse, travel construction, workamping, graphic designers, website designers, authors, and more. Other have created websites and memberships programs. If this is something you are truly interested in I urge you to email me (via the contact button) and I can connect you with several Facebook groups that will get all the answers you need. Hey ran across your blog sometime ago and then on my way up the highway hearing to Carrolton Ky on i71 who do I end up following through a short cinstuction zone but your travel trailer with your blog advert I’m the back window. What a small world. That is too funny! Thank you for stopping by!